In a previous post, I’ve described how to create catchment areas with pgRouting shortest_path() function. The solution described there calculates costs from the starting node (aka vertex) to all other nodes in the network. Depending on the network size, this can take a long time. Especially, if you are only interested in relatively small catchment areas (e.g. 50 km around a node in a network covering 10,000 km) there is a lot of unnecessary calculation going on. This is where you might want to use driving_distance() instead. Driving_distance() offers a parameter for maximum distance/cost and will stop calculations when the costs exceed this limit. But let’s start at the beginning: installing the necessary functions. Both are available through the project repository at Github. Get them and execute them in your pgRouting-enabled database. Now, you should be ready. The only new value is “distance”. That’s the maximum distance/cost you want to be contained in the result set. “distance” has to be specified in the same units as the cost attribute (which is specified in the “sql” text parameter). The cost attribute contains the total cost of travel from the starting node to the vertex_id node. We will only be using vertex_id and cost. The use of edge_id is a mystery to me. Please read the new instructions for pgRouting 2.0. The aim of this post is to describe the steps necessary to calculate routes with pgRouting. 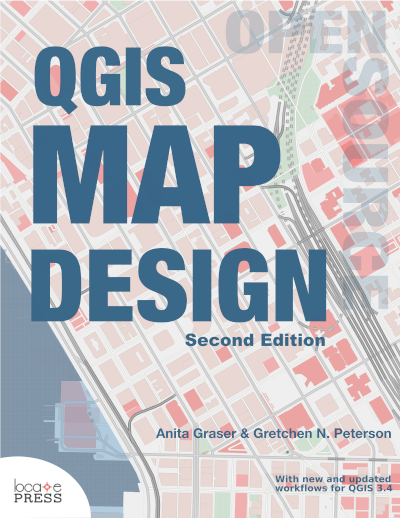 In the end, we’ll visualize the results in QGIS. pgRouting can be downloaded from www.pgrouting.org. Building from source is covered by pgRouting documentation. If you’re using Windows, download the binaries and copy the .dlls into PostGIS’ lib folder, e.g. C:\Program Files (x86)\PostgreSQL\8.4\lib. Start pgAdmin and create a new database based on your PostGIS template. (I called mine ‘routing_template’.) Open a Query dialog, load and execute the three .sql files located in your pgRouting download (routing_core.sql, routing_core_wrappers.sql, routing_topology.sql). Congratulations, you now have a pgRouting-enabled database. 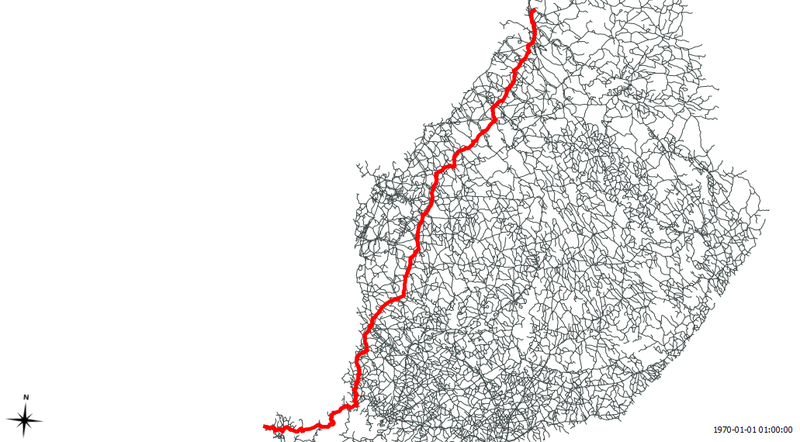 The following description is based on the free road network published by National Land Survey of Finland (NLS) (Update January 2013: Sorry, this dataset has been removed). All you get is one Shapefile containing line geometries, a road type attribute and further attributes unrelated to routing. First step is to load roads.shp into PostGIS. 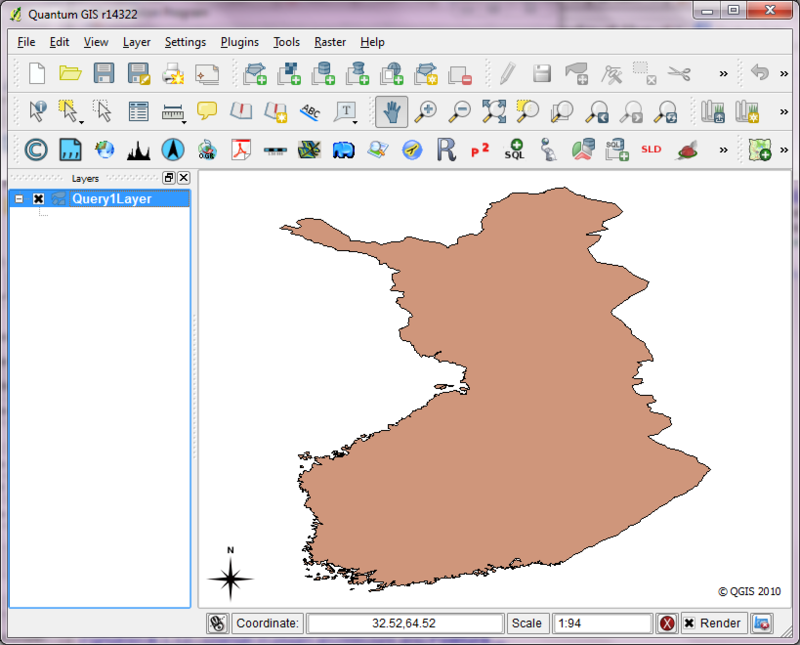 This is easy using PostGIS Manager – Data – Load Data from Shapefile. I recommend adding a spatial index to the resulting table. With RT Sql Layer plugin, we can visualize the results of a query. The results will be loaded as a new layer. The query has to contain both geometry and a unique id. Therefore, we’ll join the results of the previous query with the network table containing the necessary geometries. For further pgRouting-related posts check my list of pgRouting posts. Sometimes, we just want to visualize the contents of a PostGIS table containing some x/y data but no actual geometries in QGIS. 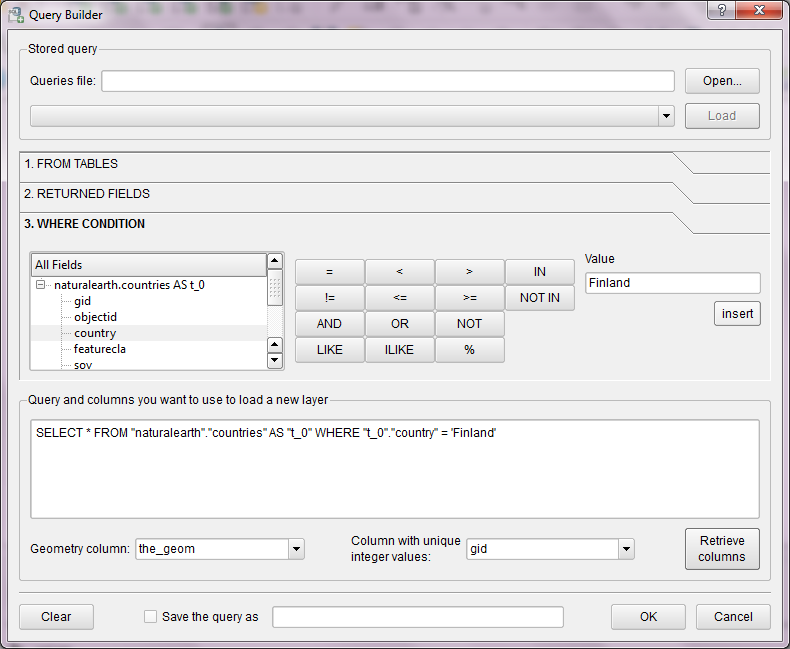 But there the problems arise: We don’t have the right to add a geometry column, the table doesn’t have a suitable ID or OIDs (QGIS demands a unique integer ID) and we can’t or don’t want to mess with the database anyway. Loading the table with “Add PostGIS Layer” will result in a non-spatial layer (or fail if you use an older QGIS versions). RT Sql Layer Plugin to the rescue! Have you ever wondered how to comfortable visualize PostGIS queries? 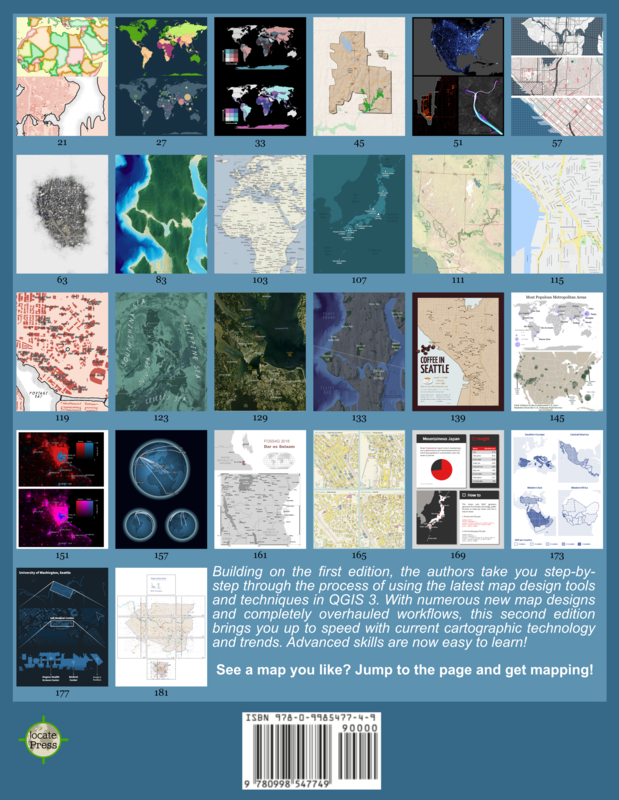 Meet “RT Sql Layer” a powerful and comfortable QGIS plugin that allows building and visualizing queries on your PostGIS data. It allows saving/loading of queries to speed up your work flow. RT Sql Layer is available through Faunalia Plugin Repository. 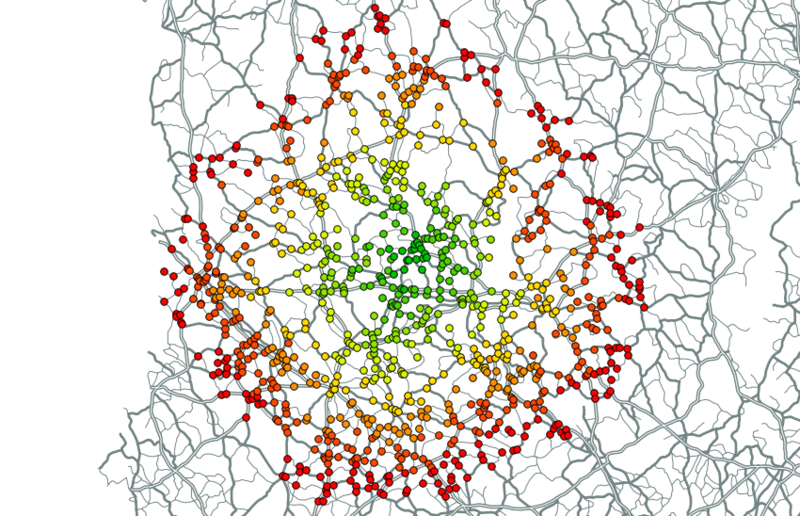 For another great example on what can be achieved with this plugin, read Carson Farmer’s post on “pgRouting, OpenStreetMap, and QGIS” where he describes how to build your own routing database and visualize routing results in QGIS with RT Sql Layer.